Editor’s note: Today, we introduce you to Becky Morales, the mastermind behind the cool blog Kid World Citizen, which is full of “global activities” and our newest SpanglishBaby contributor. Please help us welcome her into our Familia. ¡Bienvenida, Becky! 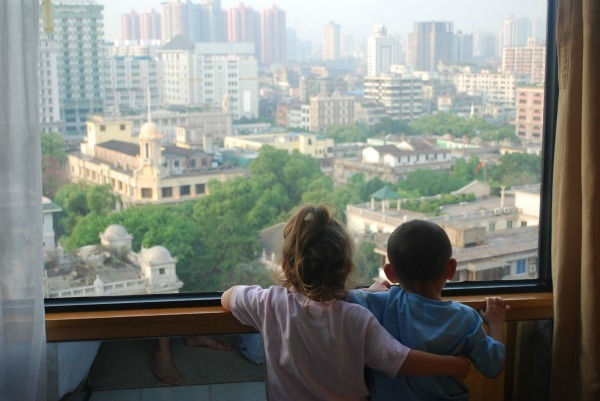 Much to our delight, when our son Toñito was 3.5 he said his first word in Spanish: “coche!” pointing at the cars zooming past our hotel in Guangzhou, China. That’s right, we were finishing his adoption proceedings in China. We had just met our adorable, Mandarin-only-speaking son 10 days before, and immediately began speaking to him in both English and Spanish (with a healthy sprinkling of our limited Chinese!). My years as an ESL teacher had me miming, doing sign language, and using lots of simple repetition to make ourselves understood. Even while still in China, Toñito slowly began to understand some of our most common phrases: bye-bye!, leche, comer, let’s go!. Whether learning a first, second or third language, children generally acquire receptive language skills first (understanding what they hear), followed by expressive language (being able to speak), and finally learn literacy skills. Children who experience an abrupt native language loss often go through a silent period, as the new language replaces their first language within the first four months of coming home. Toñito overcame this as he gradually learned to communicate his needs, from bits of sign language, to pointing and grabbing us by the hand to show us what he needed. 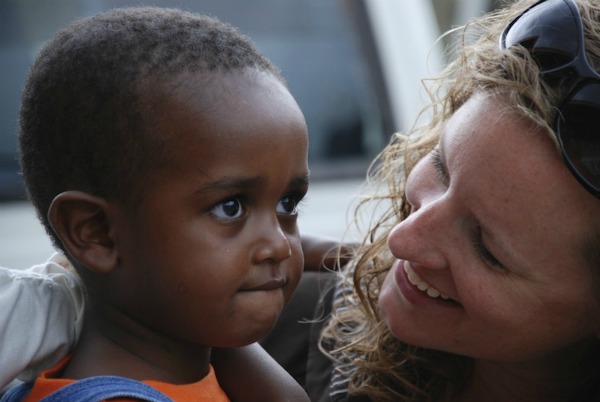 Language development delays in children who spent time in an orphanage may be inevitable, simply because a large number of children in the care of a few adults means less verbal stimulation. Many times segregated by age, toddlers do not have language role models and often times play without adult interaction. This equals less exposure to vocabulary and structure. But despite these challenges and delays, children who are adopted absolutely can learn two languages simultaneously — and we have 2 bilingual sons to prove it. 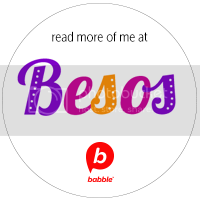 Before adopting Toñito, I had scoured the internet in search of bilingual families who had adopted a child, and had immediately begun using two new languages with them. All of the families insisted: “Kids are sponges — they will be able to soak up both languages.” We are now celebrating four years since we adopted Toñito from China, and two years since we adopted our other son Ricky from Ethiopia. I am delighted to report that both of my sons speak Spanish and English (with a little Spanglish a veces) as do my biological daughters. Bilingual families generally develop a language strategy that works best for their lifestyle, to assure their children get exposure to their different languages. Some families choose OPOL: “one parent, one language,” with the idea that each parent will speak their native language. This works wonderfully for families whose children spend a lot of time with each parent. However, because we are living in the US, and my husband works full-time and travels, their Spanish exposure would have been too limited. In our family, we try to speak mostly español unless we are with English-speaking friends. This method is sometimes referred to as Minority Language at Home (ML@H). It was only natural to begin using this arrangement with our new son- despite the bewilderment of well-meaning friends, relatives, and even teachers. The negative comments did not deter us: Don’t teach him Spanish! That will just confuse him… Teach him English first, and then once he’s mastered it you can move on to Spanish… Poor little boy, that’s too many languages! We persevered, with patience and encouragement, and let him develop his two new languages at his own pace. Any child learning a language- whether it be her first, second, or third- needs to be verbally stimulated. As parents, we can surround our kids with vocabulary-rich activities such as naming, comparing, describing, and categorizing objects around the house, supermarket, zoo, or on a walk. Experts recommend reading 20 minutes a day, but when learning two+ languages, read as many books as you can! Describe the pictures, retell the story, and guess what might happen next. Finally, let kids play with other children that speak in both target languages, so they can listen to role models of the same age. 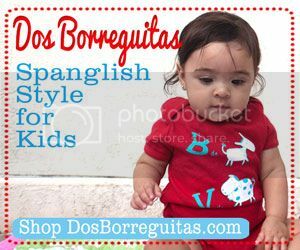 With consistency and love, your children will be bilingual. How lucky are we? We get to hear “I love you” in two languages! Bravo Becky to sticking to what you know is right, not only as a professional, but as a madre! It’s not easy being the Only One — it often feels like you are in an episode of the Twilight Zone and can’t get out! ja ja!! But seriously, felicidades for your efforts and keep spreading the love! Thanks Elizabeth! I agree- parents know best for their kids and we have to trust our gut. I knew they could do it, and here they are:). Another example of parents staying the course on what we know is “right” for our kids, despite sometimes negative feedback. Your kids are so lucky – first, to have been adopted..and second by parents who will enrich their lives with the gift of language. Good for you guys! I would love to see more stories about how your kids do in the future! Thanks Kathleen- language IS a gift, I totally agree! My kids are lucky, but I feel like the luckiest woman in the world to be their mom:). Bravo!! – Thats very exciting that he is learning two new languages. It is commonly referred to as a myth that “Kids are sponges — they will be able to soak up both languages.” I think just to emphasize the fact that it is not necessarily easy for the kids and to understand that part. Will you be able to have him in a Chinese dual language program when he enters school? That would be so awesome for him to be trilingual and to keep up with his heritage language!! Gracias Ali- we’ve all heard that kids are sponges, and then parents get frustrated when language doesn’t happen “fast” enough. But even when kids are silent at first, their little brains are taking it all in and working on receptive language- and one day all of that knowledge and vocabulary will surface. We have had him in Saturday Mandarin classes since he’s come home, and we applied to a Chinese immersion program last year but didn’t get in. I really hope that someday we can get him into more intensive Chinese lessons- we’ve been looking at spending a summer in China at an intensive day camp- who knows? Maybe in the near future! Imagine Spanish, English, and Chinese! Welcome to the la familia, Becky! How wonderful for your family is have your experience as an ESL teacher… I’m sure those skills are invaluable in your journey of raising bilingual kids. 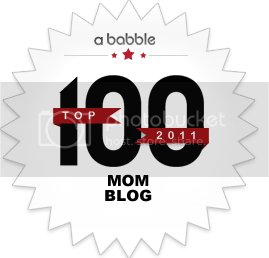 Looking forward to visiting you at Kid World Citizen and enjoying more of your posts here at SpanglishBaby! Becky, you are amazing as always!